I'd never quite understood why there was a market for 'toddler wipes' as well as 'baby-wipes'. Surely they're the same thing? Why do toddler wipes seem more expensive per-wipe? Until recently, I'd dismissed the thought. Last month we went on holiday abroad. When you're travelling, it's hard to take everything you need with you. At home we tend to use kitchen roll or a cloth to tidy up Lara's mucky face after a meal. On holiday, we used baby wipes. By the end of a one-week holiday, Lara's face was red and raw with little spots all around her mouth. I was convinced it was to do with the baby wipes (We were using Pampers Sensitive). Lara does have sensitive skin but I hadn't realised quite how different the skin on the face was to elsewhere on her body. For the days following our holiday, I made a conscious effort to use just water on Lara's face after meals but sometimes baby wipes are just so much more convenient for tidying up after a mucky toddler. A cloth needs washing after every single meal these days and kitchen roll seems to be eaten up at an astonishing rate. Baby wipes are just there, moist, effective and.... harsh on the skin. I was sent a sample of the Vital Baby Hand and Face Wipes to try. They aren't marketed as baby wipes, and now I understand why. Since using the Vital Baby wipes at breakfast and dinner, Lara has had no problems whatsoever on the skin around her mouth. 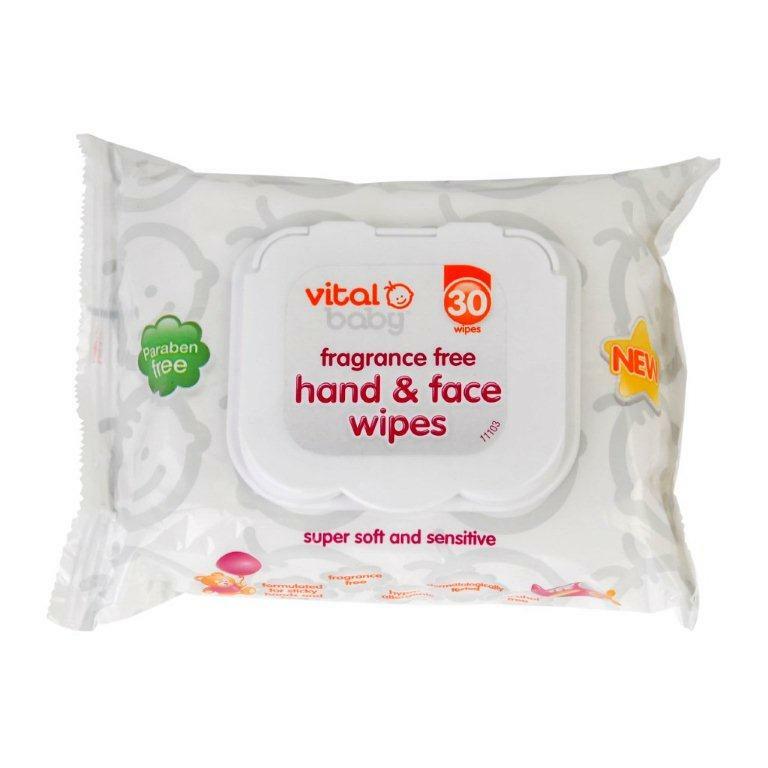 The Vital Baby wipes are paraben-free and alcohol-free which certainly helps. 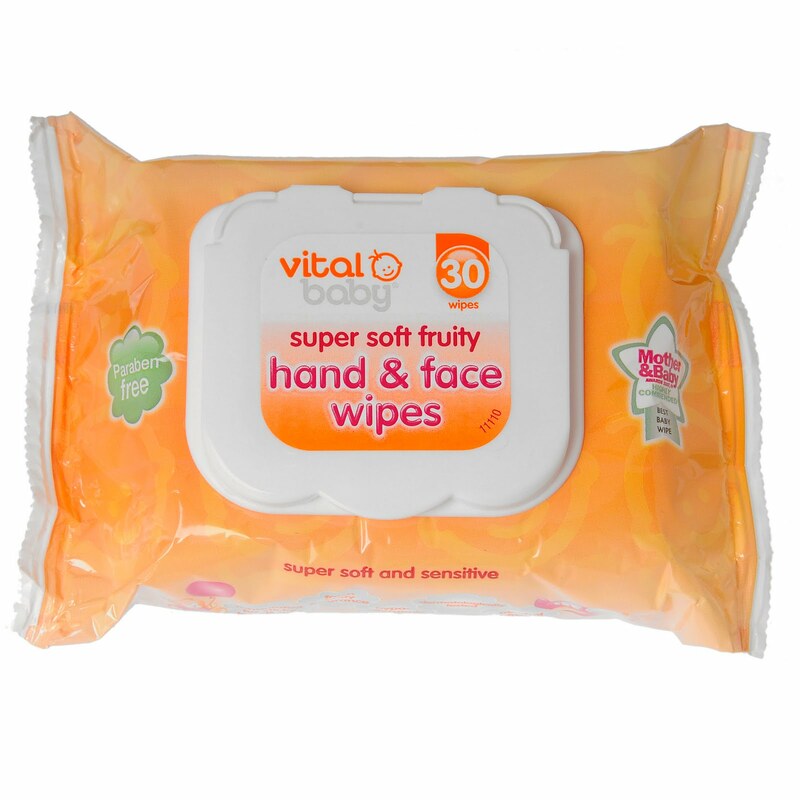 I found the Vital Baby wipes to be a good size with a perfect level of moisture which made them effective at thoroughly cleaning. We all loved the apricot scent of the 'fruity' wipes but the unfragranced version was just as impressive. 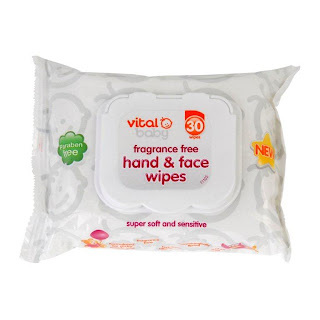 We have been so impressed by the Vital Baby wipes that we have been out and bought a huge pile of them from Boots to keep in the kitchen and in the changing bag. Maybe there is a market for toddler wipes after all! 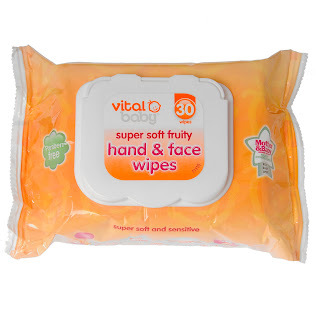 The Vital Baby wipes have just entered the Mellow Mummy baby wipe index at number 4 (They would have been higher if they were an all-purpose wipe).